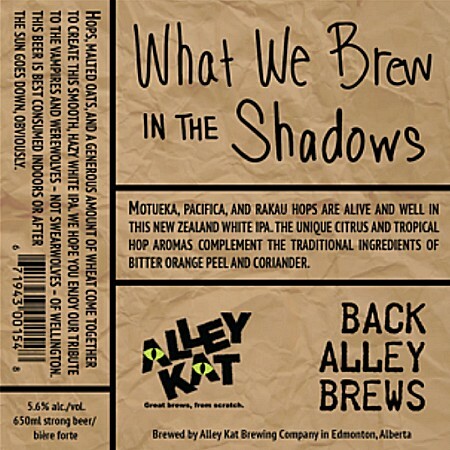 EDMONTON, AB – Alley Kat Brewery has announced details of the next release in the Back Alley Brews series of limited edition one-off beers. Hops, malted oats, and a generous amount of wheat come together to create this smooth, hazy White IPA. We hope you enjoy our tribute to the vampires and werewolves – not swearwolves – of Wellington. This beer is best consumed indoors or after the sun goes down, obviously. What We Brew In The Shadows will be officially launching tomorrow (September 6th), and will be available in 650 ml bottles at Alley Kat and select retail stores in Alberta while supplies last.